The wonder of video streaming sites such as Youtube and Vimeo has made the nostalgia of childhood even more accessible to adults on a day-to-day basis. Assuming you haven't had enough of children's television by the time your own children have finished melting your brain with endless reruns of In The Night Garden (or whatever today's young minds are being warped with), you can be watching a vintage episode of (for my generation) Playdays or Rosie and Jim at the click of a mouse. But now fans of the wide-ranging and, it seems, endlessly beloved work of Oliver Postgate (of Noggin The Nog fame) can extend their wanderings through yesteryear with a copy of his autobiography, Seeing Things, which was published in 2000 originally before being pimped upon his death in 2008 for republication in fancier packaging. The hardback edition is a thing of beauty in itself, with a sparkling red and gold cover, and is replete with photographs reproduced on high-quality paper in both colour and monochrome. What of the text itself, however? With the world and his dog seeming to have an autobiography out these days (often of the ghostwritten variety), perhaps it's normal to be cynical. And certainly Seeing Things is not perfect: it's unclear what the title refers to, and at times the prose can be akin to the description of Postgate himself, given by his son in the book's epilogue: "[it] would be like taking a clock apart to see how it worked: you end up with a pile of cogs and springs and none the wiser." 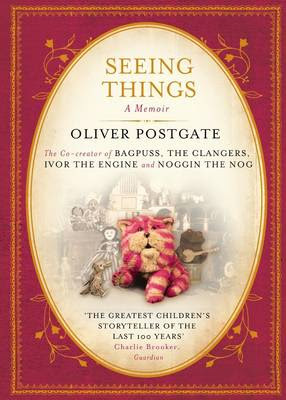 Such a precise simile made me wish at times that Daniel Postgate, rather than his progenitor, had written Seeing Things: the prose emitted by the creator of Bagpuss is at times rambling and unfocused, causing the reader to lose interest as he dwells in excessive detail on subjects where he fails to engage us or realise that we are not as expert as he is. However, the parts that are of interest (and there are many) are absolute gold mines. There are many amusing anecdotes relating to how programmes like The Clangers were received, as well as stories relating to his relationships with the programmes' commissioners. And for those of us that enjoy all of the behind-the-scenes, "how did they do that?" kind of hocus-pocus, Postgate does not disappoint us there either, letting us in on all kinds of staging secrets. In these cases his fondness for extravagant minutiae is put to good use, and we are left full of admiration for the patience and tireless work that his magical creations required for their success. Ultimately, in spite of its longwindedness, Seeing Things is a fascinating read that will bring fans back again and again. Now, I'm off in search of the autobiographies of John Cunliffe and Ivor Wood - creators of many programmes that I also enjoyed as a child, including Postman Pat, Charlie Chalk, and Bertha.